The US House of Representatives voted Attorney General Eric Holder in contempt of Congress over his obstruction in handing over documents with the ‘Fast and Furious’ government gun walking program. Democrats House minority leader Pelosi Holder Obama, the liberal MSM and the numerous Democrats have called it a political witch hunt. The criminal contempt of vote was 255-67. However, that is hard to say this vote was political AG Holder when 17 Democrats crossed party lines and voted to find Eric Holder in contempt of Congress. The House also passed civil contempt of Congress 258 – 95. The House of Representatives voted to hold Attorney General Eric Holder in contempt of Congress Thursday for failing to provide documents relating to the Fast and Furious gunwalking program. The House took two votes, one on criminal contempt charges, which passed 255-67. The criminal contempt of Congress is likely not to go anywhere as the Justice Department, which Holder heads, is the department responsible for opening a criminal investigation. The second charge, which passed 258 – 95, was a civil contempt charge, could move to federal court where it could take years to litigate. Though the action puts more pressure on the administration to abide by the subpoenas and provide requested documents. Rep. Allen West (R-Fla.) on Thursday blasted his fellow members of the Congressional Black Caucus (CBC) for staging a walkout on a contempt vote by the House against Attorney General Eric Holder. West, an outspoken freshman congressman and a Tea Party favorite, is the only Republican member of the CBC. He voted in favor of the contempt resolution. “Lady Justice wears a blindfold because she represents objectivity — in that justice is or should be meted out objectively, without fear or favor, regardless of identity, money, power, gender or race,” he wrote. Caucuses are there in Congress anyway? What disrespect to the family of Brian Terry. The walk out was kinda trumped by the fact that 17 Democrats voted to find him in contempt of Congress. Some one needs to remind the Black caucus, its not about the color of one’s skin, its about the content of one’s character. So what is his sentence ??? Is he going to jail tonight ??? What is going to happen ??? the walkout by the black caucus was blatant racism. don’t forget that pelosi and her thug sidekicks also supported this racism. 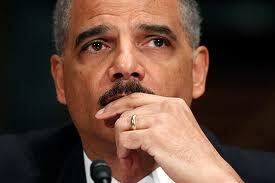 holder is guilty and needs to be arrested along with obama today, no questions asked, no rights. I am not suprised at the behavior of the Democrats in congress. If things don’t go their way, they have a tendency to run away and hide. Behaving as a six year old when they don’t get their way. If you don’t do what I want, I’ll just pick up my toys and go home. To the Democrats this never about facts or reality, it is all about making a show. It doesn’t matter that an act or acts by the DOJ to run guns into Mexico is illegal and that at least two Americans have been killed along with hundreds of Mexicans because of the need to make some political speech by Obama look good.